Austin Psych Fest has become one of the most consistently solid festivals over the course of the past few years, and this year’s Texas installment goes down in May at the usual spot, Carson Creek Ranch (though they’re calling the fest “Levitation” now). Recently the festival has been spreading its reach, like their CMJ showcase in New York last year, and now they’re bringing the psych to Chicago. 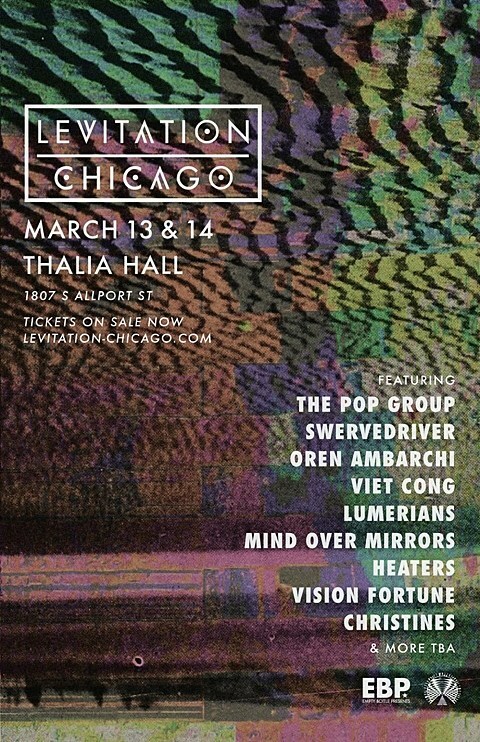 APF is putting on a smaller two-day Levitation Chicago installment at Thalia Hall on March 13 and 14 with an amazing lineup. They’ve got veteran post-punks The Pop Group, shoegaze heroes Swervedriver, proggy psych improvisor Oren Ambarchi, crushing post-punks Viet Cong, trippy garage rockers Lumerians, drone-obsessed Mind Over Mirrors, garage partiers Heaters, brooding droners Vision Fortune, ear-shattering shoegazers Christines and more all coming to Chicago for the festival. Two-day passes for the festival are on sale now, and more bands will be announced in the coming weeks.